Performances by Valerie on 4 1/2 octave marimba of the entire series oftranscriptions to date. 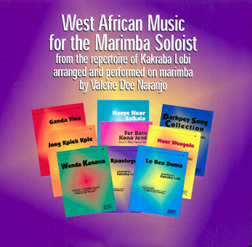 West African Music for the Marimba Soloist features marimba transcriptions of Gyil music of the Lobi people who live in Ghana’s Upper-west region. It focuses, especially, of the repertoire of Maestro Kakraba Lobi. This style, metadepent and two- three- and four-voiced, is an especially suitable African style for the marimba soloist. The Gyil (pronounced JEE-lee) is one of the grandparents of the marimba. It is made from wooden bars that are suspended, on a frame, over calabash gourd resonators. Gyil pieces, like jazz tunes, have specific elements that stay consistent, yet each player is expected to improvise. These transcriptions, suitable to interpret literally, are also meant as guideposts for improvisations. At the CD’s conclusion are short excerpts with percussion, provided to suggest performance options. Available through on-line and regular retailers.